China promises to help Guinea, Liberia, and Sierra Leone rebuild. From August 8 -10, Chinese Foreign Minister Wang Yi visited to Sierra Leona, Liberia, and Guinea – the three countries most devastated by the Ebola outbreak in West Africa. As of the latest World Health Organization figures, the outbreak, which was officially reported in March 2014, had resulted in over 27,000 cases and 11,281 deaths. As The Diplomat reported previously, China mounted an historic response to the Ebola crisis. Beijing sent aid and medical teams to the affected countries, marking the first time China offered such aid to combat a foreign health crisis. The People’s Liberation Army has been particularly active in offering aid and assistance, breaking new ground in its drive to take on “new historic missions.” Xinhua reports that China’s total aid to affected countries was worth $120 million. The Ebola outbreak is finally winding down, with only two new confirmed cases reported from July 27 to August — “the lowest weekly total to have been reported since March 2014,” according to the WHO. But for the countries affected by the outbreak, it will be a long, uphill battle to rebuild. 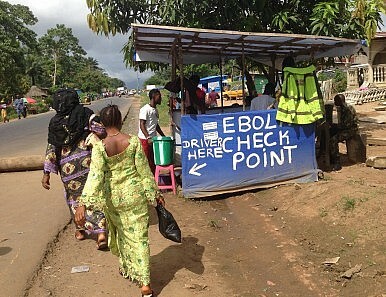 Even with the outbreak slowing, the World Bank predicted $1.6 billion in lost GDP for Guinea, Liberia, and Sierra Leone in 2015 – more than 12 percent of the three countries’ combined GDP. That comes on top of economic losses worth over $500 million in 2014. The damage was most pronounced in Sierra Leone, which saw its economic growth rate in 2014 plummet from an expected 11.3 percent to 4 percent. This year, Sierra Leone’s economy is projected to shrink by 2 percent, according to the World Bank, thanks in large part to curtailed investment from abroad. With the outbreak seemingly drawing to a close, the countries hit hardest need not only medical help, but economic investment to help them recover and rebuild. Here, China is on far more familiar ground, having become famous for its investments and joint projects in Africa. According to the AidData project, from 2000 to 2011 China committed to over 1,600 projects worth $16 billion on the African continent. In a meeting with Sierra Leone’s president, Ernest Bai Koroma, Wang promised “cooperation in public health, mining, energy, agriculture, fishing, infrastructure and human resources,” according to CCTV. Liberian Foreign Minister Augustine Kpehe Ngafuan said in a press conference with Wang that “China has agreed to help Liberia with the construction of a ministerial complex which will host about 10 ministries. Also, China will construct a coastal highway.” The existing coastal highway, Reuters notes, links Liberia’s capital, Monrovia, with a port at Buchanan and then the Ivory Coast – but much of the route is currently unpaved. The AP also reported that China was looking into a possible steel-making project in Liberia. In Guinea, Wang’s last stop, he promised to encourage more Chinese investment in the country, including helping with constructing new infrastructure. Wang held up this Chinese investment as yet another symbol of the special relationship between China and African countries. This was particularly clear during a speech he gave in Liberia. “You will see houses and roads built by China and Chinese companies helping the people of Liberia,” Wang promised. As West Africa moves into what Wang called the “post-Ebola era,” China is focusing on the economic and social reconstruction work to be done. As Wang pointed out, poverty was the “root cause” for the Ebola outbreak, and reducing poverty should be a key goal, along with establishing and improving public health systems. Those promises allow China to comfortably return to its previous modus operandi in Africa: large-scale, often government-backed investment in construction, resource extraction, and infrastructure projects. That approach has its fair share of critics, but there’s no denying that Guinea, Liberia, and Sierra Leone will sorely need the investment as they try to rebuild from a crushing epidemic. China is stepping up its role in containing the deadly virus' rampage in West Africa. China’s ‘Shadow’ Network of International OrganizationsChina’s Military Wages War on EbolaHas China Found the Cure for Ebola?Are Chinese Loans To Africa Good or Bad? That’s The Wrong Question.Is eSwatini on the Brink of Cutting Ties With Taiwan?